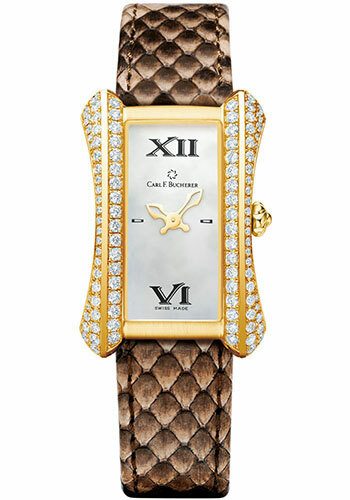 26.5 x 38 mm 18K white gold case with 102 diamonds 1.6 ct, 7.4 mm thick, domed sapphire crystal, mother of pearl dial, quartz movement, brown python skin strap, folding pin buckle with 18K white gold. Water resistant to 30 m.
26.5 x 38 mm 18K white gold case with 102 diamonds 1.6 ct, 7.4 mm thick, domed sapphire crystal, mother of pearl dial, quartz movement, gray python skin strap, folding pin buckle with 18K white gold. Water resistant to 30 m.